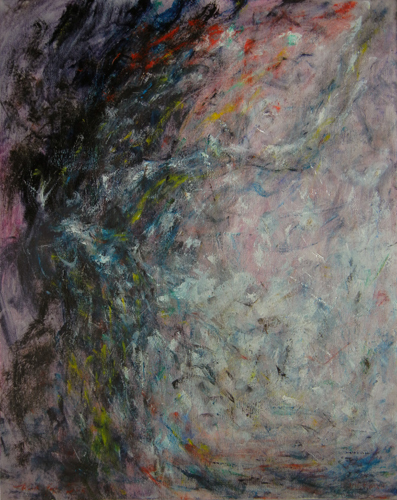 The title of this painting, July Meteors, originates from a Chinese phrase, 七月流火, which means that in July, when stars move westbound, cooler weather arrives soon; I have always been drawn to the mystic and somewhat fatalistic image of this concise yet profound phrase, without much understanding. Right before the Fourth of July this year, suddenly there was some unexpected disturbances took place in my life and I was mostly assailed by shock and dismay, out of all things, and soon I was enveloped in a chill, much colder than the already too cool San Francisco summer. It was the realization of abrupt and decisive change caused me much alarm and disquietness and then I suddenly understand the meaning of that phrase, and the helplessness sedimented through thousands years of valiant and often futile struggle, and composed this rather evocative abstract piece, to channel my compound feelings. I entered this piece for a juried exhibition and silent auction at Berkeley Art Center and it was accepted for the event.